Nine years ago, I got fed up with reading articles about people all around the country and abroad fly fishing with mouse patterns and landing truly giant trout. It seemed every medium I read or watched, there were people showcasing how productive mouse fishing could be. The only problem was, where I lived in North Georgia, as well as the majority of my neighboring states, I heard very little about anyone fishing mouse patterns. You’d find a few patterns here and there in the fly bins at the local fly shops, but in actuality, I think most of those were being fished on farm ponds for bass not for trout. I couldn’t take it any longer, so I decided to go on a mousing binge, strictly fishing mouse patterns on my days off. My goal being to figure out if mouse patterns would work just as well on my home waters as they’ve proven to work so well on the blue ribbon caliber trout streams and rivers across the globe. My first big brown trout fishing a mouse pattern. It didn’t take long to find success. 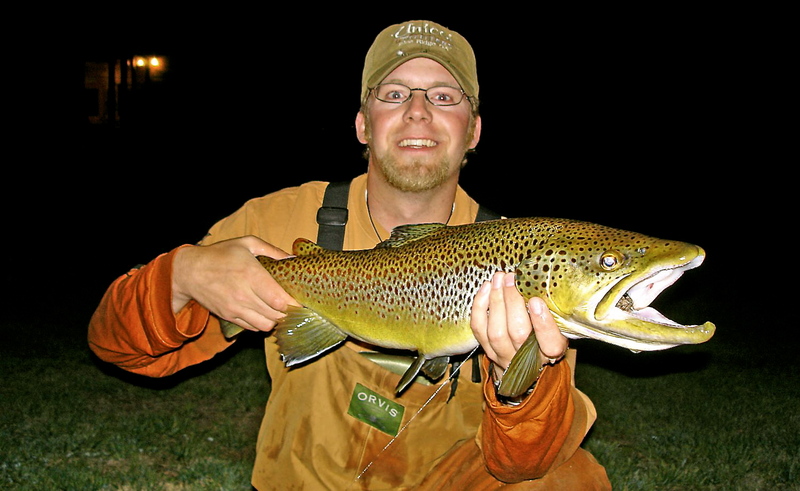 My second trip out I landed a 26 1/2″ wild brown trout on my home tailwater. It was one of the biggest documented fly caught brown trout on the surface that anyone could remember for quite some time (many have been landed by other anglers since). I then moved on to some of my favorite small mountain trout streams where I’d never heard of anyone tying on and fishing a mouse pattern. Again, my mouse experiment yielded incredible success, and I quickly turned into a mouse fishing enthusiast. I didn’t know if I was having luck because no other anglers were fishing these big mouse patterns, or if it was simply that very few anglers in my area were willing to accept mice were regularly being preyed upon by our local trout. I didn’t know for sure, but in all honesty, I didn’t really care, because success was success, and I was going to milk it as much as I could before everyone else caught on. Here’s What I learned about Fishing Mouse Patterns that first year. You can just about fish mouse patterns anywhere with success. Do not exclude small trout streams. Although you seem to catch bigger trout on average with mouse patterns, I did find smaller trout will aggressively eat them as well. Brown trout aren’t alone, rainbow trout, brook trout (char), and steelhead will chomp on mouse patterns too. I learned there are other ways of fishing mouse patterns other than the traditional down and across skating technique. On smaller streams in particular, I had very good success fishing the mouse patterns casting them upstream and working them back downstream like a bass popper (pop, pop, pop, pause…, pop, pop, pause….WHAM). I found that timing the hook-set with mouse patterns was crucial. Often big trout would swirl and knock at the mouse pattern, and then come back to eat it. The best way to get solid hookups was to wait on the hook-set until you felt tension, very much like steelhead fisherman practice. The best mouse patterns were highly buoyant and had a hook on the very rear of the fly. A 1x-3x, 7 1/2′ to 9′ leader were most practical for absorbing the strong smash and grabs, abrasive teeth, and limiting leader/tippet twisting. 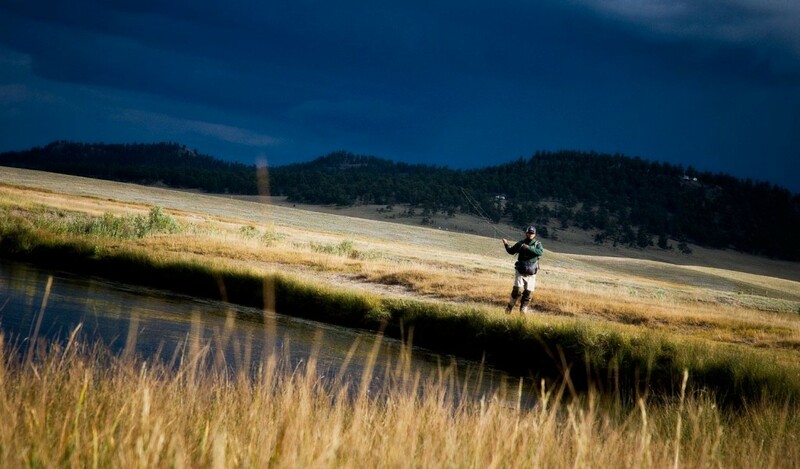 The size of stream, and how leader shy the fish are, should dictate what rig you use. Although low light situations (dawn & dusk) were best for fishing mouse patterns, I also had success fishing them during the middle of the day. This means you can have success fishing mouse patterns any time of the day. Deep water or moderate to slow moving water provided the most success, and it’s where I hooked up with the biggest trout on my home waters. Really turbulent water seemed to mask the silhouette of the mouse and its effectiveness. The colder months of the year seem to be less productive for mouse fishing. I only assume it’s because many of the mice have to stay sheltered underground most of the day to stay protected from the cold weather. Because of this, I now focus fishing mouse patterns from the spring through fall. Tying the mouse pattern on with a loop knot provided the best action. Cover lots of water. If you do not get looks or chases within a few casts, the fish usually aren’t interested and it’s a waist of time to keep making presentations to the same water. For more information about mouse patterns and fishing them, check out these links below. Come fish with us in the Bahamas! This entry was posted in Fly Fishing and tagged best mouse fly patterns, Fly Fishing, fly fishing blog, fly fishing tips, fly fishing with mouse patterns, Gink & Gasoline, Gink and Gasoline, how to fish mouse patterns, Kent Klewein, Louis Cahill, Sunday's Classic / You Can Mouse Just About Anywhere, trout fishing by Kent Klewein. Bookmark the permalink. Wow! I will give it a try in the spring. Please do and get Paul to as well. Nice piece, I have had mouse patterns for years and yet to try on a trout stream. Will change that this spring. Thanks for sharing. Let me know what happens when you break them out this spring. Don’t let others deter you. Its fun to step away from the same old tactics and strategies. Let me know what you find out on your waters. Maybe you can shoot a video on this topic Kent? Louis and I are trying to get into more video on the blog. I will drop the idea by him and see what he thinks. He’s a mouse guru as well. We’ll try it when it warms up some. I know a fella who would row a barge… (With lights for night adventures) just to see this… He may just be as sick as y’all are for it to. Solid information. I’m writing my own series of articles about mousing. Most anglers don’t realize how big fish get in their rivers, and the only way to find out is by mousing. I did well mousing the morning hours in Nipigon for brook trout a few years back and want to try it this year on my local brook trout streams, see if I can’t find a 20″. Mousing is one the most exciting ways to fish, and is definitely one of my favorites. I need to do it more often. You’re right about fishing mice in the middle of the day. It’s just as effective, but waiting on that hook set sure is harder when you can see it coming! In the movie Eastern Rising they had huge success, catching 30″ rainbows, fishing mouse patterns during the day. If a trout is hungry, and something with food value, such as a mouse, drops into their lap…it’s going to eat no matter what time of day it is. And yes, I mouse regularly for bass in the summer on farm ponds ’round here. It’s a blast! Kent, what’s your favorite mouse patterns? I know that it works in WNC! I read that fish will strike at it tring to drown or severely mame it before taking it. It explained the reason for this is that you dont want a live angry rat nawing in your stomach. Made sense. The artical said if the fish did not connect, to let it drift to imitate the mouse being hurt or drown and the fish may try to reclaim it. Enjoy your day and God bless! That article sounds really interesting. I can tell from experience that I’ve had plenty of trout smack the mouse and come back for the real grab the second time around. Thanks for the comment and God Bless to you my friend. Always thought there was something a little disconcerting but very cool about a fish chomping down on a mammal! Have only tried mousing for trout a few times situationally – tie one on when I get to a big, slow hole. It’s a lot harder than it sounds to wait until you feel tension when you see a big trout come up from the bottom and smack the crap out of your mouse! I haven’t been able to hook one but will keep trying. Have caught some nice river bass on them – they don’t toy with mice. Mice don’t swim very well so seems pretty logical that upstream presentation with lots of pauses would work. I’ve missed my fair share of mouse strikes with trout. The more you fish them the better you get at the hook set. It’s by far one of my favorite ways to chase big trout. Keep fishing them. I wonder on our home river if its that the trout are actually looking for mice because they eat them regularly, or if it’s simply a case of a meal too big to pass up for trout who have never even seen an actual rodent? I’ve seen a lot of weird stuff on the banks and in our river, but muskrats are the closest thing to a mouse I’ve ever seen. Either way, My interest in trying this during generation is peeked. Thanks for the inspiration, bud!!! Your tips, no doubt will save me some trial and error. Next up… Duckling patterns… Ever seen one? I’d say it’s a little of both my friend. There’s plenty of mice that venture to the banks to get a drink and end up in the water. That being said, I think the profile and action of a big meal opportunity on the surface is enough appeal to generate lots of reaction strikes from trout. They work pretty darn good on our home waters. Looks like we’re going to need to try them together soon. I agree … Once warm, it’s on. I think it’s mice, moles, voles, and any other species of little rodent or other living thing that may find itself in the water. There must be baby muskrats around since we have momma and papa here. I see plenty of ducklings on our river in the spring, and I am sure they cause some upward interest in looking for something alive and big on the surface. How many times have you seen big fish strike your large thingamabobber, especially pink and white ones? Drives me crazy. I have a box of mouse flies from AK and from tying them over the years with hopes to use them here. I am ready to go. So many opportunities to fish, so little time. I have tied several of these and the cast decently (with the appropriate rod) and look just like a half dead duckling in the water. Go to http://www.flytyingforum.com/index.php?showtopic=76026&hl=duckling#entry570724. This fly is tied by Pat Cohen. To see the picture, I think you will have to log in, however Pat Cohen has a facebook page where he sells a dvd on how to tie the ‘merganser duckling’. I received a book for Christmas from my sister, “Night Fishing for Trout: The Final Frontier”. While he never mentions using a mouse, he does suggest that even skinny water holds very large trout that exhibit nocturnality, trout which can be caught using significantly larger flies than conventional wisdom suggests. Ever tried fishing these waters at night? It is even more exciting to do this at night where the only indication of a strike is a very large splash where you guestimate your fly to be. I am fascinated with using the mouse (and this spring, a duckling) for exactly the same reason TBone points out, it is very disturbing to catch fish that eat mammals (or small birds). Over the years I have caught hundreds and hundreds of bass (and other critters) on deer hair mice. Super fun. “Mouse. Tie and try.” Added to resolutions list. No bass over here, targeting trout and chub.